Garrett Bernard Atkins was born December 12, 1979 in Orange, California. His parents, Diana and Ron, later had a daughter named Kristen. The family lived in the Southern California town of Irvine, where Garrett made a name for himself in youth league sports. Garrett loved baseball. He always had talent for hitting, and his father taught him this was a gift to protect and improve. When other kids in the neighborhood were playing video games, Garrett and Ron could be found on an empty diamond honing his swing. As a youngster, Garrett often got angry that his father made him practice when his friends were hanging out. Soon, however, the extra work began paying dividends. During their father-son batting sessions, Ron implored his son work on hitting through the middle and drivingthe ball the other way. He would tell Garrett that Tony Gwynn—one of the boy’s favorite payers—would always follow a home run by trying to poke a hit the other way. By the time Garrett reached University High School, this approach came naturally. U-High in Irvine was know for its academics first, its performing arts second and its sports third. Its most famous alumni was comedian and movie star Will Ferrell. Zach de la Rocha, lead singer for Rage Against the Machine, was also a graduate. Garrett was familiar with another well-known alum, former major-leaguer Tim Wallach. During his 17 years with the Montreal Expos, Los Angeles Dodgers and California Angels, Wallach was an All-Star five times at the hot corner and led the National League in doubles twice. Garrett, who had more power than Wallach, dreamed of an equally productive big-league career. Garrett lettered for U-High in baseball as a sophomore, junior and senior. He played the outfield and third base, and also pitched. He earned all-league honors in each of those three seasons, two of which brought a state championship banner to the school. Garrett was twice named league MVP. Garrett used the entire field, hitting for average and power. Along the way, he set a number of school records. In his junior year, he established a single-season mark for doubles (19) and hits (51). The following year, he hit .557 with a school record for home runs (13) and runs scored (49). By his senior season in 1997, Garrett was regarded as one of the nation's hottest teenage prospects. Garrett was recruited by college baseball powerhouses UCLA, USC, Cal State Fullerton and Oklahoma State. He was also selected by the New York Mets in the 10th round of the amateur draft. Garrett visited the New York clubhouse when the Mets made a trip to San Diego. He was introduced to manager Bobby Valentine and talked with some of the players. Despite getting the star treatment from the club, Garrett decided to take the scholarship offered by the Bruins. He would join a team led by seniors Eric Byrnes and Eric Valent. Garrett was part of a recruiting class at UCLA that many considered among the best in the country. It didn't pan out that way. The Bruins went 24-33 and finished second to last in the Pac 10. Garrett was one of the team's bright spots. Coach Gary Adams installed the frosh as his starting third baseman. Garrett was a pillar of consistency. He fashioned a 33-game hitting streak and led the club with a .388 average. The only blemish on Garrett’s record was the trouble he had at third base. When Adams sensed that his young star had lost his confidence at the hot corner, he moved Garrett to first base as a sophomore. Garrett did not respond well to what he perceived as a demotion. His hitting suffered and soon he found himself batting sixth in the UCLA order. Never one to shrink from a challenge, Garrett came back strong and upped his average to .375. One suggestion from Adams that Garrett embraced fully was rooming with fellow blue-chip prospect Chase Utley. The pair moved in together as freshmand and became inseparable. To this day, they remain the closest of friends. Garret moved back to third for the Bruins in 2000 and led the team to a Top-20 national ranking. UCLA went 38–26 and made it back to the NCAA Tournament. Unfortunately, the Bruins were knocked out before earning a berth in the College World Series. Garrett’s final numbers—a .352 batting average, 17 homers and 72 RBIs—were more than enough to interest the pro scouts. The Rockies drafted Garrett in the fifth round that spring. He signed with the club instead of returning for his senior season at UCLA. Garrett immediately joined the Portland Rockies of the short-season Northwest League, where he switched back to first base. His teammates included Brad Hawpe and Clint Barmes. Garrett and Barmes would accompany each other at each stop up the ladder to the major leagues. For Portland, Garrett batted .303 and was among the league leaders in hits, RBIs and on-base percentage. He was named the circuit's MVP. Garrett played first base again in 2001, this time for Class-A Salem Avalnache of the Carolina League. He batted a robust .325—tops among all Colorado minor leaguers—and led the league with 43 doubles and a .421 on-base percentage. Aaron Cook and Matt Holliday were among the top players on the Avalanche, who were coached by Dave Collins. Fearful that he would never hit for enough power to be a big-league first sacker, the Rockies decided to move Garrett back to third base in 2002. They promoted him to the Class-AA Carolina Mudcats of the Southern League, where his average dipped to .271. However, he began to flash the power the Rockies were hoping to see. His 12 homers more than doubled his output from the previous campagin. After the season, Garrett played in the Arizona Fall League and hit .354. Garrett entered spring training in 2003 with no chance of making the club. Still, he opened eyes with his performance at the plate, batting .525 in 23 games to set a new team Cactus League record. His next destination was Colorado Spings, where he enjoyed a breakout season for the Triple-A Sky Sox. Garrett batted .319 and was tabbed as the top hitting prospect in the Pacific Coast League. He earned two brief callups to the Rockies and hit just .159 with 14 strikeouts in 69 at-bats. Though Garrett had nothing left to prove in the minors, that's where he began 2004. He destroyed PCL pitching with a league-high .366 average despite a serious intestinal disorder that slowed him for the better part of a month. At the time, he had just turned in a 23-game hitting streak. Garrett was now viewed as a complete hitter. He had opened up his stance and was pulling the ball with authority. He learned to use his bottom hand from coach Alan Cockrell, the same man who taught Jim Thome his power stroke when he was a minor leaguer with the Cleveland Indians. Garrett was rewarded with a September call-up and hit .357 in spot duty. Knowing he had a shot at Colorado's third base job in 2005, Garrett recognized that he had to improve his quickness at the hot corner. That winter he reunited withUtley for a winter workout regimen designed to improve his flexibility and agility. He arrived at spring training feeling great. Colorado manager Clint Hurdle made Garrett his starting third baseman to being the '05 campaignb. But just before the season, Garrett strained a hamstring and went on the DL. He returned at the end of April and settled into a nice rhythm. Garrett adjusted to the big leagues rather smoothly. He was fooled at times by off-speed stuff, but few pitchers could throw a fastball by him. Garrett topped NL rookies with 221 total bases, 31 doubles, 45 walks and 45 extra-base hits. He finished the season strong with a 16-game hitting streak in September, the longest of any first-year player in the majors. Garrett’s other numbers—.287, 13 homers and 89 RBIs—were good enough for a fourth-place finish among NL newcomers. Garrett took over at third base with the understanding that the team regarded him as a temp until stud minor leaguers Ian Stewart or Jeff Salazar were ready. At that point, he might be looking at first base or, if Todd Helton was still with the club, a new address. Garrett took a different approach to his situation. Of all the young guns slated to rebuild the Rockies, he was the first to rise from the minors and nail down a starting job. Soon Holliday, Hawpe, Troy Tulowitzki and other components in Colorado’s grand program would join him. Garrett underscored that view with a breakout year at the plate in 2006. Hurdle bounced him around in the batting order. As long as he was in the lineup, Garrett didn't care if he hit second, fourth or fifth. Over the season's first half, he batted over .300 with good power. After the All-Star break, Garrett moved up to third in the order—the spot traditionally reserved for Colorado’s best hitter. Helton, who had occupied that spot since the departure of Larry Walker, slid down to fifth. Garrett responded by turning in a spectacular season. He hit .329 with 29 homers, 198 hits, 117 runs, and 120 RBIs. His consistency blew his teammates away. His average climbed over .300 in the season’s third game and never dropped below that level. Another measure of his discipline and maturity was his patience at the plate. Garrett walked 79 times against just 76 strikeouts. He also became a quiet leader in the Colorado clubhouse. When a teammate’s ego got a little too inflated, Garrett was a master at letting the air out in a way that made everyone laugh. Even though the Rockies finished with a losing record, there was a winning attitude in the locker room. This would become clear in 2007, when the club struggled through much of the year, only to make a magical September run. Garrett was one of many Rockies to suffer through a slow start. After two months, he was hitting in the .220s with three home runs and 22 RBIs. It didn't take long for Garrett to pick up the pace. The rest of the way he torched the ball at a .338 clip. Incredibly, he finished with a .301 average, 25 homers and 111 RBIs. Down the stretch, he was a monster with runners on base, batting .425 in RBI situations. In all, he drove in 88 runs in his final 97 games. With Holliday having an even better season, and Tulowitzki and Hawpe hammering the ball in the second half, the Rockies stayed within striking distance of the Wild Card. Colorado won 14 of its final 15 games to make the playoffs. The Rockies then swept the Philadelphia Phillies and Arizona Diamondbacks to reach the World Series. Their race for the title ended in a sweep by the Boston Red Sox. Garrett hit a homer against the BoSox, but he batted just .154 overall. He also struggled against Philadelphia and Arizona. With a young, confident lineup that figures to stick around as a unit for a while, the Rockies are a team to be reckoned with. Garrett was one of the few stars Colorado did not sign to an extension over the 2007 winter, leading some to wonder what he had to do to ensure his future with the club. Some believe he will replace Helton at first some day. Others think he may be Colorado’s prime bargaining chip in a mid-season mega-trade. Garrett seems unfazed by the uncertainty, probably because he is certain he can produce regardless of extenuating circumstances, whatever they may be. As he enters the prime years of his career, he has to be considered among the game’s elite hitters wherever he plays. Garret has wonderful hands and a keen batting eye. His swing is smooth and natural, and he gets tremendous leverage on batted balls. He has been hitting with a major-leaguer’s approach since childhood, so when an adjustment is needed, it’s never more than a minor one. This accounts for Garrett's consistency at the plate. His greatest talent may be the way he works pitchers. Often they give Garrett exactly what he is hoping for. Garrett's ticket to the majors was his bat. Most scouts felt that his glove was not good enough to handle third base. He worked hard to improve and made himself into a dependable fielder. His top asset is his powerful arm. he still needs to work on his first step and overall footwork. Grounders that were once an adventure have become routine for Garrett. It doesn’t hurt to have Troy Tulowitzki on the left side. Garrett is as far from a rah-rah leader as you get. Teammates respect him for his work ethic and his ability to produce in the clutch. Garrett is used to winning and will do whatever is asked of him to secure a victory. * As a UCLA freshman, Garrett finished sixth in the Pac 10 batting race. The top three hitters were future major leaguers Willie Bloomquist, Xavier Nady and Eric Munson. * Garrett's 33-game hitting streak in 1998 set a new UCLA record. * Garrett and Chase Utley were inseparable in college. When it came time to play summer ball, they signed up with the same team in the Cape Cod League. * Garrett was UCLA's first three-time All-American. He ranks second in school history with a career average of .369. * In 2001, Garrett finished second in the Carolina League batting race to Victor Martinez. * Garrett doubled against the Pittsburgh Pirates in his first major-league at-bat. 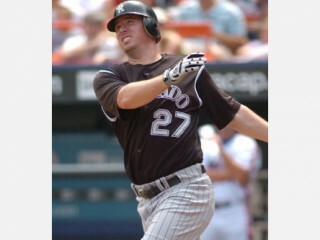 * Garret’s 16-game hitting streak in 2005 tied Colorado’s rookie record, originally set by Juan Pierre. * Garrett hit two grand slams in 2005. He and Ryan Howard were the only rookies to hit more than one that year. * In 2006, Garrett’s 120 RBIs were second to Alex Rodriguez’s 121 among major-league third basemen. * Garrett homered off of Hideki Okajima in the 2007 World Series. * Garret is single. He spent winters in L.A. until 2006, when he moved to Denver after the season. * Garrett was the best man in Utley's wedding in January of 2007 . * Garrett is an avid reader. He also makes his own stock and financial decisions. * Garrett’s favorite TV shows include "24," "Prison Break," "CSI" and "Law & Order." View the full website biography of Garrett Atkins.